Midnight is a mystery cat. We don't know if he is a boy or girl. 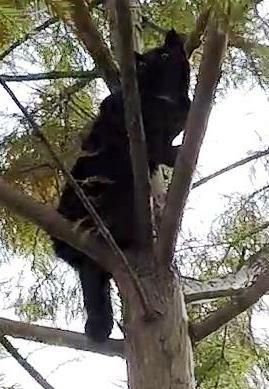 All we know is that he climbed a cypress tree in Jim's backyard sometime during the night. Jim and his neighbor, Theresa, were familiar with several cats in the neighborhood, but neither had ever seen this cat before. There were no Lost Cat flyers in the neighborhood and no posts on the Lost Pets web page. Since the cat is all black and appeared in the night, I will just call him Midnight. I never know what to expect from an unknown cat. He could be the friendliest cat I ever met or he could be the meanest feral cat I ever saw. He could be super easy to rescue or he could be the most difficult of my life. With unknown cats, I just have to be prepared for anything. I found Midnight about 20 feet high in a cypress tree with numerous small branches that I would have to weave myself around. I picked out the clearest path upward that I could find and started climbing. Midnight never made a sound. I would have considered it a good sign if he had cried once in a while, but he never made a peep. That is a sign that he was afraid. I sweet-talked to him all the way up in hopes of calming him, but he just sat motionless while watching me ascend. He remained silent, but I considered it a positive sign that he was not panicking and climbing higher. Once I was close, I opened a can of food and reached up to offer it to him, but he had no response at all. As I was holding the food up to him, I noticed that he was trembling. It is such a heart-breaking sight to see a cat trembling with fear like that. To him, I was a predator, and he was trapped prey. Knowing that, I should have just stopped there and tried to reach him with my rescue-pole, but instead I stepped up a little higher so that I could get the food closer to him. Understandably, he climbed a little higher. It was clear now that I would need to rescue him with the rescue-pole, so I prepared for that. I made an attempt to reach him but was unable to get the noose of the pole around him before he again climbed higher. I followed and tried again. This time he walked out on a limb. I climbed a little higher so that I could reach him better and tried to snare him again. This time, he stepped into the noose just the way I wanted, and I was able to tighten the noose around his chest just behind his front legs. 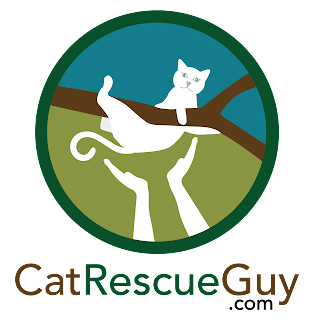 When I have used the rescue-pole on cats in the past, I have always been pleasantly surprised to see that the cats turned limp when I snared them. They never struggled or fought with the pole. They just became docile cats that silently accepted whatever I did to them. Midnight, however, was different. He struggled and fought to get away. He grabbed every limb within reach and held on for dear life. When I tried to put him in the net, he grabbed it with his claws and made it more difficult for me to get him fully inside. After a little difficulty, however, I put him all the way in the net, released the noose of the rescue-pole and withdrew the pole. I had him securely locked in the net, but I wondered why he struggled so hard while the other cats simply accepted it so gracefully. Perhaps I tightened the noose too tight. On one earlier rescue, I failed to get the noose tight enough and that cat fell out of the noose to the ground. Since then, I have vowed to err on the side of getting the noose too tight rather than not tight enough. Or maybe it was just that he had enough fighting energy left inside of him since he had been in the tree only half a day. All the other cats had been in the tree for days and were possibly too exhausted to fight anymore. I wish I knew the answer. Perhaps with more experience I will understand this better. I hate that I am having to learn what works and what doesn't on real cats. My aim is always to reduce suffering, not cause it. Yes, some small short-term suffering that gets the cat out of the tree is better than the long-term suffering he will face if he is not rescued, but the sight of a cat struggling in terror on the end of the pole is still a disturbing one to me. I hate to see that. But, back to Midnight. I brought him down and was hoping that he would have a microchip. While I had him in the net, I scanned him very carefully but did not find a chip. At that point, we all decided to just let him go and, hopefully, find his way back home. After all, he did not appear to be a feral cat and he looked as if he could easily belong to someone nearby. So we turned him loose and let him go. Wherever he goes or belongs, at least he is not suffering in a tree anymore. I have to apologize for the video. The camera was pointing too far downward, and often the cat is at the top edge of the frame. As I watch the video, I often find myself tilting my head backward as if that would allow me to see up higher. Trust me; it doesn't work. When he is in the frame, the bright back-lighting made him appear as only a dark silhouette with no visible details. Also, after I brought Midnight back down, I forgot to turn the camera back on for his release. Consequently, I do not have any flattering images of him. He was a pretty cat, though. He was all black except for a thin white line under his neck. I hope he belongs to someone and found his way back home.